The Sketchworthy – Notes, Sketches, and Ideas iPhone, iPod Touch, and iPad app creates customized journals with drawings, web pages, images, and locations that can be saved as a PDF document. The interface is attractive and appealing, and the tools are accessed with intuitive, agile gesture controls. There are some great surprises and upgrades available in the in-app store too. You create your first journal by touching the plus icon at the bottom of the screen. You title it, add notes, and choose a color. The colors are bold, pretty primary colors including blue, red, green, orange, and pink. A plain black option is available as well. Your journal is added to your journal bookshelf. You touch it to add items to the page. For each page you add to a journal, there are four options. A touch on the piece of paper icon will create a clear screen for you to add information with gesture controls. The old school paper map icon opens the option to add a location. The spider web opens a browser to add web information. The polaroid icon gives you the chance to choose a photo from your iPhone library or shoot one from within the Sketchworthy – Notes, Sketches, and Ideas iPhone app. To add drawings and text with gesture controls, the interface functions nicely. At the top of the screen, there is a bar with icons that you swipe horizontally to access the editing tools. The options include undo, redo, trash, pencil, marker, and eraser. The undo and redo add or subtract incrementally. For the pencil and marker, you tap the icon to use it on the screen. A double tap on these icons opens a page of options to change the color and size of the pencil and marker. The ability to add locations, web pages, and photos is a neat touch, and the interface, again, is simple and complementary. You touch web, surf, and tap done to add it to your journal. The location can be activated using your location services. You add a photo from your library, size it with pinches on the screen, and adjust the light with a volume style bar at the top of the screen. When you complete a journal, it stays in an iOS Newstand-style library. For each journal, you can touch it to make the cover fill the screen. You press the arrow icon at the bottom of the screen, and a PDF copy is created. You can view, export, or send via email. 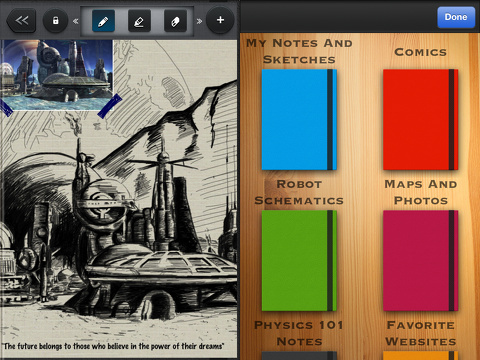 The Sketchworthy iPhone, iPod Touch, and iPad app is a universal download for $1.99. The tools and functions merit the price, but the thoughtful in-app purchases are great. You can buy more refined tools like a productivity package for $1.99 with monthly and weekly calendars. That would be a handy tool for families and teachers. The game pack for $.99 makes road trips and visits to Aunt Edna’s house fun, as you can play the license plate game, hangman, and tic tac toe on your iPhone and iPad. There are also in-app purchases to add more colors and tools to enhance what you draw on the screen. This would also be a great tool to track business projects, ideas, and inspirations. 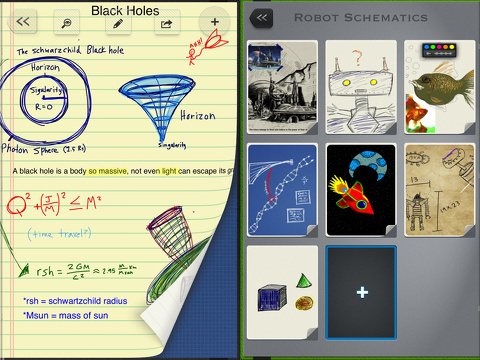 The Sketchworthy iPhone, iPod Touch, and iPad app is the notebook you no longer carry, and the pen you never could find. AppSafari review of Sketchworthy – Notes, Sketches, and Ideas was written by Jenni Ward on March 12th, 2013 and categorized under App Store, Enterprise, iPad apps, Productivity, Universal, Utilities. Page viewed 3964 times, 2 so far today. Need help on using these apps? Please read the Help Page.